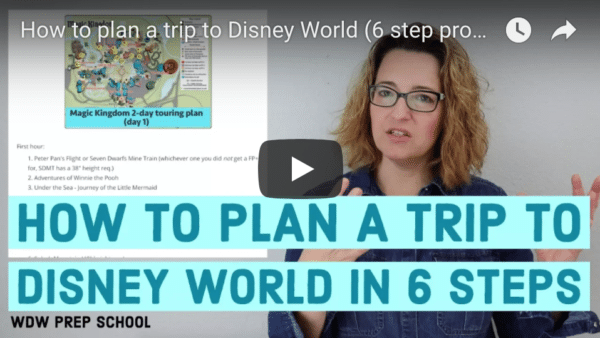 Many people travel to Disney World as part of a group, whether it be with family, friends, teams, etc. However, when it comes to dining, not all Table Service restaurants may be able to accommodate large numbers, and that can make planning your Advanced Dining Reservations difficult. 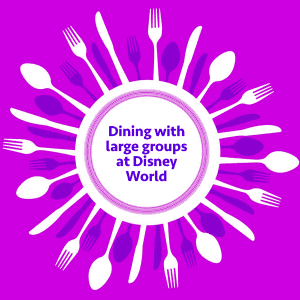 If you plan on making reservations for a large group while visiting Disney World, here are some tips and a list of available Table Service restaurants with their maximum party sizes to help you plan. Even though the restaurants below have the possibility of booking parties the size listed, the availability may be limited and/or unavailable depending upon the time of year you are traveling and the time of day you wish to dine. If booking a large group, try eating during off hours instead of during peak dining times to maximize your chances of securing an Advanced Dining Reservation. Try booking online first at 6:00 am EST and then, if needed, you can call the reservation line for help when they open at 7:00 am EST. Some of the Downtown Disney/Disney Springs restaurants hold back availability. If you can’t secure a reservation through Disney, try calling those restaurants directly. If you can’t snag 1 reservation for all of you, consider breaking your reservation into 2 smaller ones. Then, when you check in, do so together and ask to be seated near each other. Note - If you do try to book 2 reservations you will need to call the reservation line as opposed to booking online since the website won’t allow you to hold 2 reservations that overlap. Even if you book 1 reservation, depending on your party size and the restaurant, you may be split up into multiple tables. An automatic gratuity of 18% is added onto all parties of 6 more. If you plan to book at a restaurant that requires prepayment (like Cinderella’s Royal Table or Hoop Dee Doo), don’t forget you’ll have to prepay for everybody unless you are on the Dining Plan. Like all Advanced Dining Reservations, book in the order of popularity NOT in the chronological order of your trip. All members of a party must be present in order to be seated, so make sure everybody knows when and where they are supposed to be! Each restaurant has a different maximum number that they will allow on 1 reservation. If your party size exceeds the number below, you'll need to call to make multiple reservations to accommodate your group. The BOATHOUSE 8 Yes Downtown Disney/Disney Springs (The Landing) Reservations for larger groups are often availble on Open Table even when Disney shows no availability. You can also try calling the restaurant directly at (407) 939-2628. Bongos Cuban Cafe 10 Yes Downtown Disney/Disney Springs (West Side) Reservations for larger groups are often availble on Open Table even when Disney shows no availability. You can also try calling the restaurant directly at (407) 828-0999. Cinderella's Royal Table 24 Yes Magic Kingdom May have better luck calling if nothing is available online. Crossroads at House of Blues 7 Yes Downtown Disney/Disney Springs (West Side) Reservations for larger groups are often availble on Open Table even when Disney shows no availability. You can also try calling the restaurant directly at (407) 934-2538. Fultons Crab House 8 Yes, 2 credits Downtown Disney/Disney Springs (The Landing) If nothing available through Disney, try booking directly through the restaurant at (407) 934-2628. Il Mulino 11 No Swan If nothing available through Disney, try booking directly through the restaurant at (407) 934-1199 OR by calling the Swan & Dolphin reservation line at (407) 934-1609. Narcoossee's 7 Yes, 2 credits Grand Floridian Call Disney Dining for parties larger than 7. Paradiso 37, Taste of the Americas 12 Yes Downtown Disney/Disney Springs (The Landing) Reservations for larger groups are often availble on Open Table even when Disney shows no availability. You can also try calling the restaurant directly at (407) 934-3700. Planet Hollywood 15 Yes Downtown Disney/Disney Springs (West Side) If nothing available through Disney, try booking directly through the restaurant at (407) 827-7827. Portobello Country Italian Trattoria 10 Yes Downtown Disney/Disney Springs (The Landing) If nothing available through Disney, try booking directly through the restaurant at (407) 934-8888. Raglan Road 8 Yes Downtown Disney/Disney Springs (The Landing) Reservations for larger groups are often availble on Open Table even when Disney shows no availability. You can also try calling the restaurant directly at (407) 938-0300. Rainforest Cafe - Animal Kingdom 8 Yes Animal Kingdom If nothing available through Disney, try booking directly through the restaurant at (407) 938-9100. Rainforest Cafe - Downtown Disney 8 Yes Downtown Disney/Disney Springs (Marketplace) If nothing available through Disney, try booking directly through the restaurant at (407)827-8500. Shula Steak House 11 No Dolphin If nothing available through Disney, try booking directly through the restaurant at (407) 934-1362 OR by calling the Swan & Dolphin reservation line at (407) 934-1609. Splitsville Dining Room 14 Yes Downtown Disney/Disney Springs (West Side) If nothing available through Disney, try booking directly through the restaurant at (407) 938-7467. Todd English's bluezoo 10 No Dolphin If nothing available through Disney, try booking directly through the restaurant at (407) 934-1111 OR by calling the Swan & Dolphin reservation line at (407) 934-1609. T-Rex 8 Yes Downtown Disney/Disney Springs (Marketplace) If nothing available through Disney, try booking directly through the restaurant at (407) 828-8739. Wolfgang Puck Grand Cafe 6 Yes Downtown Disney/Disney Springs (West Side) If nothing available through Disney, try booking directly through the restaurant at (407) 938-9653. Hi, Im looking at getting married in Florida 3rd November 2020 and having our wedding meal at Ohana (we are from the UK) We have 34 Guests. Will I get away with having 2 tables here? Also will we have to pay before we go? (this could actually prove quite positive). Lastly what kind of date will I need to book this to secure our tables? We are a family of 6. I keep seeing the phrase “an 18% gratuity is automatically included for parties of 6 or more” but what does ‘included’ mean? Do we need to have cash or some other form of payment ready to cover the tip or is it “included” on the price we paid for our DDP? “Included” means they add it on to your bill without you filling in the amount. Disney Dining Plan credits don’t cover gratuity, so you’ll need to have a card or cash available to cover the 18%. We have a party of 5 – 3 adults, a 6yo, and a (newly) 3yo. I have only been able to find a table of 4 at the popular places. Do you know if they’ll let us seat with the 3yo on a lap? You must make the reservation for all 5 of you, even if the youngest one sits on your lap. It’s for fire code purposes. You can try booking two different reservations (like a table of 3 and table of 2) and then when you check in, you can tell them you’d like to be seated together. I tried today to make a reservation for 11 for June at Coral Reef in Epcot and they said that Coral Reef cannot seat parties of more than 8. So I think your information needs updating. Hi, We are a group of ten going to Disney World in September 2016. I just tried to make reservations for Mickey’s Backyard Barbecue by calling the reservations line but none were available. If I keep calling back what are the chances there will be cancellations that become available? Should I try making smaller reservations and hope I get everyone in? What is the cancellation policy? I know you have to pay in advance. Do you know if the bill can be split for large groups between families? Shannon, These are all great tips! I always love the information you put out. I would have loved this post in 2014 when I planned a trip for 17. Dining was tricky to say the least. I wanted to comment about ‘Ohana. We attempted to get ADR for ‘Ohana for all 17 during Wishes one night. Even though, I attempted to book that reservation first exactly on the 180 mark for the end of our trip, I was unable to secure it. We instead did two separate reservations as you mentioned in the post. We called a week before the date to let the staff know that we were going to want to sit together. They recommended calling the day of again. We did so. Once we got there, we reminded the host. We were all able to sit together in the middle of all of the action with a wonderful view of Wishes! It was truly magical! I just wanted to add some hope for some of you reading this who might be feeling unsure about booking two separate reservations. It worked for us! Good luck! Newbie here. If they automatically add gratuity to parties of 6, how does that work with a dining plan. Is that a separate bill? And if they add the gratuity, you do not need to leave a separate tip do you? Making plans for February and just want to do it right. Tips are separate from the Disney Dining Plan. The check you receive will show that you don’t owe anything for the food, but you’ll owe 18% for the tip which you can pay however you like. You don’t need to leave anything in addition to that unless you feel like the server deserved more. Thanks a lot! Just made planning easier. We travelled with a party of 12 earlier this year and I used a couple of ways to secure our reservations. For a couple of them I was able to make them online. For others I had to make two separate reservations using different log ins from My Disney Experience (i.e. the site wouldn’t let me reserve two tables, but I could reserve one with my account and then reserve a second one under my husband’s account). I also made a reservation of 6 people since that was the most it would let me sit, then called and asked to change the reservation to 10 people and they did it for me on the phone.